By now, you will be accustomed to the natural lifestyle photographs featured in our catalogues. Photography like this is a great way to show off new products and emphasise how they can fit into modern living. However, using photograph like this has not always been possible. In the past we had to find more cost effective ways to showcase a new collection. You may have seen some old posts on our blog about post-war Carr & Westley adverts. During the 1940’s and 50’s these one-off advertisements where how we sold our products to the general public. 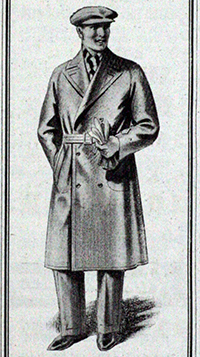 Each advert would include an illustration of the product and a wealth of detail about the style and fabric of a particular garment. By the 1970’s, we were promoting our products in simple catalogues consisting of only a few pages. It is also important to mention that around this time we began catering nearly exclusively for women. 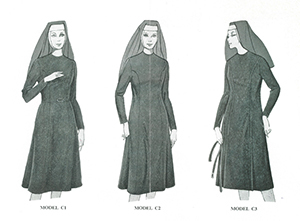 Alongside classic everyday women’s wear we included some specific clothing like nuns habits. The rise of the modern woman in the 80’s was reflected in a new style of catalogue. To accurately portray the attention detail in our garments we employed highly skilled textile illustrators to produce drawings. Much like they are still today, the clothes were diligently designed in the Carr & Westley factory, then prototypes were made up. These were then sent off to individual illustrators based around the country, where they were hung on mannequins and carefully drawn to show off the style, fit and details. We know of one particular illustrator who was responsible for many of the beautiful black and white drawings which we have stowed in our loft here at Bourne Mill. She was so dedicated to bringing our garments to life that she worked for us well into her 80’s. Black and white was slowly replaced by colour, then in turn, when photography became possible, by simple white background photographs. These were the days of film photography, making the whole process more complex than we take for granted now! As we moved into the 21st century our catalogues began to reflect contemporary living. Around 2010 we took the step to photograph our products out and about in real-life scenarios. Suddenly, the classic functionality of our clothes was brought to life. Over the last few years we have given the location of the photo shoots increased thought and attention. We have thoroughly enjoyed soaking up the sights and atmosphere of picturesque locations such as Bath, the quaint seaside town of Rye, Royal Tonbridge Wells, pretty Bourton-on-the-Water and the Regency town of Cheltenham Spa. This has added another angle to our collections and promotes the association between Carr & Westley clothing and an active lifestyle. We would love to hear your thoughts and suggestions for potential future photo locations – so drop us a line if you have any ideas. This entry was posted in Classic Clothing on September 22, 2014 by Harry Burton. The colours around us are changing as Autumn draws in. Here at Carr & Westley we are proud to present our fresh collection for the new season ahead. You will have noticed that the catalogue is awash with eye-catching new fabrics and prints. A particular favourite is the two-tonal Kielder print separates collection, available in this seasons must have colours – dignified cobalt and exotic magenta whilst maintaining a classic look. The Kielder Print Skirt (JP120) stands out when teamed with a subtle plain top such as the Kempsford Cowl Top (JP115) in Cream or the Stow Top (JP123) in matching Cobalt and Magenta. Another great print in this collection is the fresh Blenheim Cardigan (KT11) which effortlessly carries over a touch of Summer into the next season. It looks fabulously striking when worn with a simple Shipton Top (KT12) or navy Turtle Neck Top (KP31) combined with smart Carr & Westley trousers. We also have a fantastic selection of chic tartan skirts – a classic print hailing form the Highlands which is very much on trend this season. We noticed that the print featured heavily during London Fashion Week. Our Lindsay Skirt (S410) in deep red and green tartan is made from the highest quality pure wool fabric. Wear with the firm favourite Step Neck Top (JP39) or the Swinbrook Tie Neck Jumper (JP014) for an up to date look, perfect for the approaching colder weather. We would also like to take the opportunity to introduce the stylish new Ampney Jacket (JP133). This is a chic solution to the slight drop in temperature outside due to its light weight fabric and simple design which can be worn open or buttoned up. It looks great when matched with plain Carr & Westley trousers and a classic Turtle Neck Top (KP31). 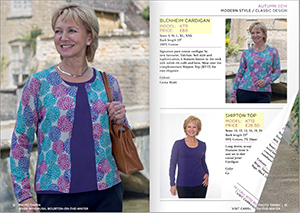 For a more vibrant look why not wear it over the elegant Lynton Top (JP125). Here at Carr & Westley we are always thinking of new ways to expand our range, ensuring our customers get a wide selection of the best garments. As always we love receiving your feedback, both about our collection and service as we continuously strive to make sure our customers feel valued and happy with our products. This entry was posted in Classic Clothing on September 17, 2014 by admin.